Tour Overview: The trip can be customized to meet your demand based on your wishes and fitness. Riders are required to cycle about 50KM per day on average in this tour, covering diverse road surfaces. 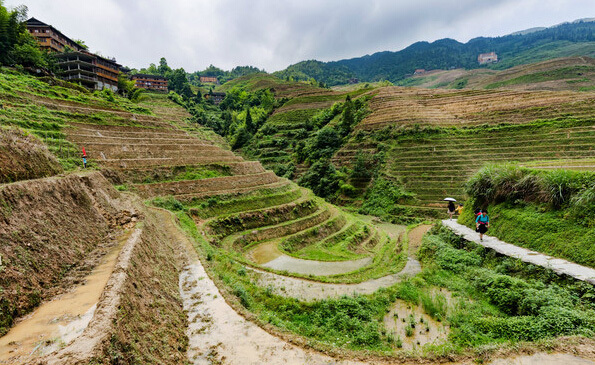 You will have plenty of time during and after the cycling for sightseeing, taking photos, relaxing along our exclusive routes and those off-the-beaten tracks from Guilin to Yangshuo. 4. Flexible itinerary and attraction visits based on your tour length. 7. Customozed to meet your budget. 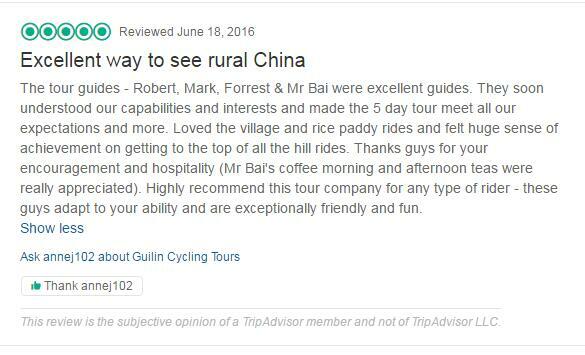 Yangshuo Cycling Tours from Liu Robert on Vimeo. Tour available starting date: Every day upon requests. Roads: Well paved concrete roads, narrow path by the riverside, countryside trails, rice filed trails, macadam, muddy road, etc. Note: If you don't want to cycle on slippery tracks or some less paved roads being affected by construction, or feel uncomfortable with getting a bit dirty after cycling on muddy tracks, please let us know to work out an easier route. If you arrive in Guilin early, we will have some time to visit Guilin city before going to Daxu Ancient Town (or staying in Guilin city is also fine). The guide of this tour will meet you at Guilin airport/train station, and transfer to Daxu. A tasty dinner tonight with a brief pre-trip orientation helps us have a better understanding of each other. 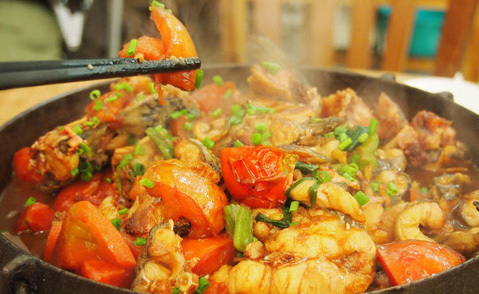 The local restaurant will offer you a delicious meal cooked with fresh local ingredients, enjoy your dinner! Overnight in Daxu. We will see how the really local people living by visting a local farmer' family beside the river and visiting a brewhouse, we will see how people make rice wine by ancient way in the morning. Following the course of Li River, our trip today covers the best bicycle greenway in Guilin. 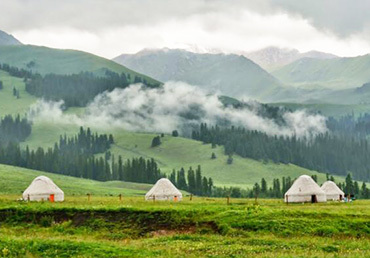 Cycling in a real fantastic picture of Kast peaks, rivers, the route today is the same one as the top cycling teams from all over the world cycled in Oct. of 2017 during the UCI WorldTour - Tour of Guangxi. The difference is that we can ride on more off-road trails, and have fun when getting closer to the rurality and nature on mountain bikes. If you enjoy the peacefulness of a small town, you will like Xingping as it is less touristy compared with Yangshuo. The scenery here is so stunning that hundreds of photographers come here every year to get their best shots. In 1998, the former US president Bill Clinton came here to visit a local fishing village. After hotel check out, we have to say goodbye to such a pretty town and then cycle into trails through mountains and villages, heading for Yangshuo. Your skill level in biking on narrower dirt tracks and off roads will be increased after today, our smiling bike guides will also give suggestions and tips to avoid the potential risks, making sure you will get a trip safe and memorable. The hidden part of the best scenery is located in the east of Yangshuo county, that’s the road we are going to hit today. 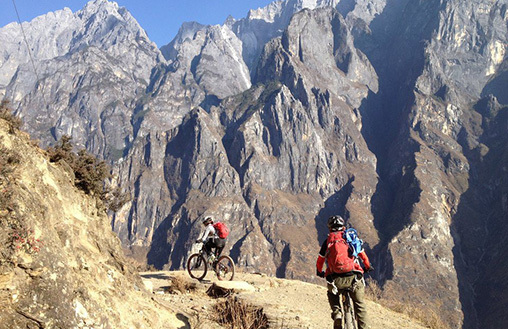 Down along the Li River, the world of a great wild countryside looked never being changed with the journey on two wheels. 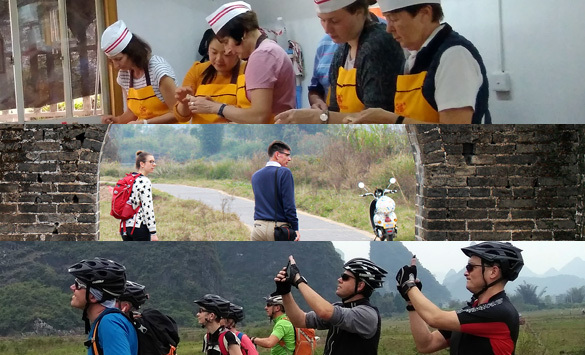 China is developing so fast now while Guilin Cycling Tour company are still finding the less visited natural way to better explore views and local lives. 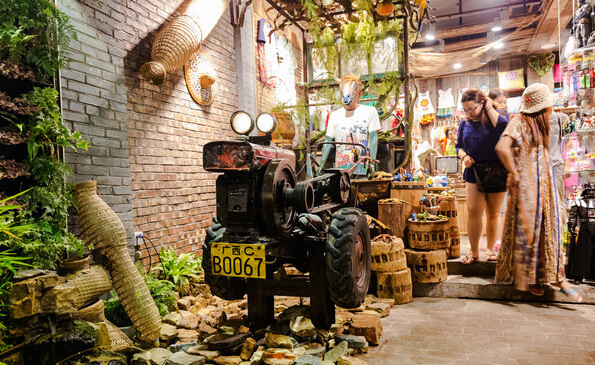 Take a visit Fuli Ancient Town, we can walk to the river bank on an old bluestone street, visit a fan-making workshop, and spend some time at a local market. Are you ready to paint something on the folding fan in China? This is the chance! The distance today is quite flexible from 40-60KM, no matter you are just a starter on bikes only looking for an easy ride to the countryside or an experienced cycling fans who did hard rides a lot, enjoy today. After check in the hotel at Yangshuo. You will have many choices for dinner tonight on your own then we will enjoy the Liusanjie Light Show tonight, but be ready for seeing thousands of tourists as it is so famous! 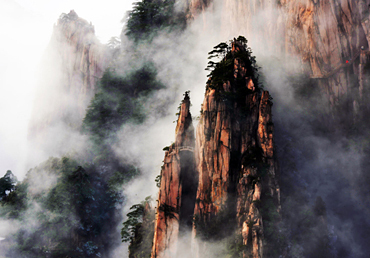 You will free to leave today or you want to stay longer in Yangshuo. * if the tour cost is beyond your expectation, please feel free to contact us. We will offer your other options and work out a trip based on your budget. 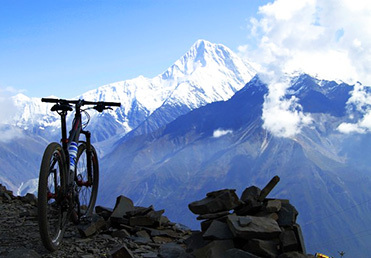 Quality well-maintained mountain bikes of 24/27 speed front suspension; Helmet is offered for free but we suggest bring your own ones and cycling gear.